Saturday is the first round of the Streamfleet Invitational Tournament and our first match is against Templis. If you are looking for information, check out this blog from CCP regarding all the details. Lots of prizes available not only for us competitors, but also for viewers! Which is pretty awesome. You should plan on watching, these matches are going to be good. We can't fly the same ships over and over, and there are no logistics on the field. So that should make for some insane PvP action. 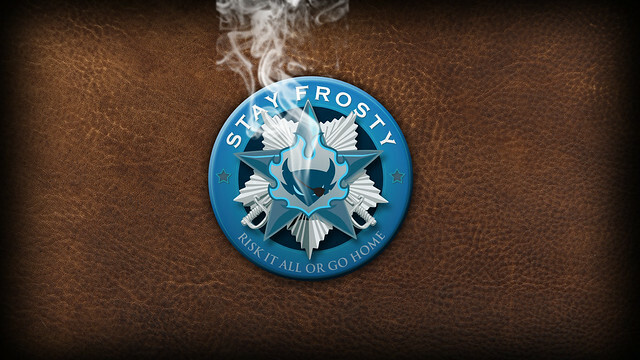 If you do watch, which you should, please root for Stay Frosty. As in seemingly every case, we are once again fighting from an underdog position. We only got into this process two weeks ago, as other teams have had much more time than us to prepare. We are not treating this like a disadvantage however, we prepared and submitted our comps on time, just like everyone else. And we've managed to carve out some good practices to prepare. As Low Sec Pirates we are used to fighting under horrible odds, so nothing new there. Jin'Taan has done an excellent job of setting this Tournament up and making the rules as interesting as possible. 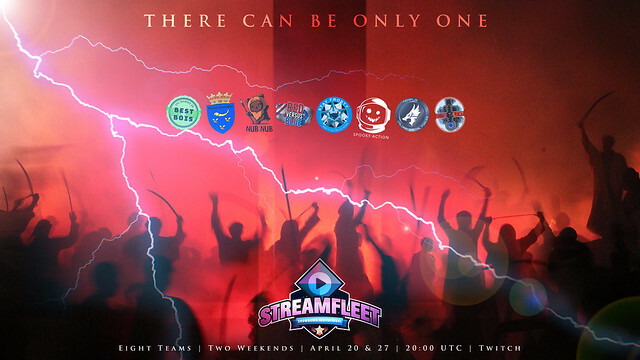 Each team has five fleet compositions that they must submit ahead of time for each day of the Tournament, and each day has its own requirements. In those individual days you can't bring two of the same ship in any of those comps. So that forces us all to be creative and not over-reliant on any specific "meta". One of the downsides of this, for the teams, is that it creates even more of a "rock, paper, scissors" situation. So extra consideration has to be given to bans and what comps to bring to each fight. Because once used, they can't be brought again. Even so, I suspect a few fights will be blow-outs on Day1, but I'm not sure how you can avoid that. Overall however, I do believe that the quality of fights will be solid and a lot different than Alliance Tournament fights. As always I won't be making any predictions. What I do know is that our team and our pilots will preform exceptionally in each fight, as they always do. I never have any worries in that regard. Our team is experienced and many of our pilots are the same ones that have flown in our AT teams. We do have one pilot experiencing their first Tournament and that has also been awesome. He has brought some new enthusiasm and energy to us crusty old veterans, which is appreciated. Lots of Tournament experience in that team. Some of us go all the way back to the NEO days. As always we are in it to have fun. Whatever happens after that will happen and we will ride the results as far as they will take us. Flying in Tournaments is one of the most fun things to do in Eve, at least in my opinion. And I look forward to flying with my friends again this Saturday. True story. Years and years ago I lived in Providence. I would often log in and no one would be about. As a low skill point relatively new player, my options were limited. As usual, I refused to be bored. So I would often make up things to do. I once flew all the way to the bottom of the map, trying not to be killed. I once did the same to the top of the map. I would shoot Russians undocking from space stations. I would solo camp Gates. I would try to guess the passwords of POS in the region. I got very good at guessing passwords. I once found the POS that housed a AAA Titan and guessed the password to the shield. I tried to get as close as I could to the Avatar without being seen or de-cloaked in my Manticore. I have screenshots of that adventure. But it wasn't until recently that I was reminded of another adventure involving a Titan that didn't end as well. I had forgotten about the time I stole a Titan. It might be difficult for newer players to remember a time when spotting a Titan in space was a big deal. When I started playing Eve there were about 17 Titans in the entire game. There used to be a website that actually tracked all the known Titans and where they were last seen, who flew them, etc. Seeing a Titan and surviving the encounter was a pretty big deal. The very first time I saw a Titan was when it appeared off a gate and blew us all up. I also have a screenshot of that as well. So one day I log in and decide to take my trusty Manticore out into another region to stir up some trouble. (Please forgive me, I forget most of the details.) Eventually my wanderings brought me into a system that showed an Erebus on scan. After some nifty d-scan work I managed to discover the Moon around which the POS was located. Sure enough, inside the shields was an Erebus. Just floating there. This was my first sighting of this specific Titan. No one else was around, so I started trying to break the shield password. Which is essentially a process of stupid guessing. Over and over again. I don't specifically remember how long it took, or what the actual password was, but I do remember it being stupid. My rate back then was about 1 in 5. The 4 I couldn't break were always good passwords. The ones I could break were always dumb. It is probably not surprising how many were essentially variations of 12345ABC or something easy to remember. I was obviously yelling in Alliance chat by this time. The problem was this was an off-time for everyone else. 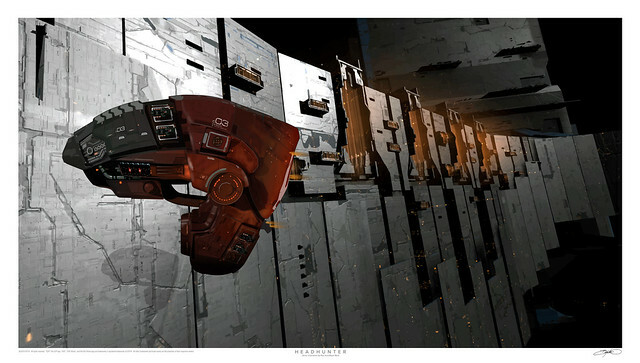 The other problem was that there was a limited number of Titans in Eve, which also meant a limited number of Titan pilots. I was in a real pickle. I had a Titan!! But no way to do anything with it. By this time I had a crowd of about 5-6 other pilots with me. We tried bumping the Titan. We tried rousing our friends in other Alliances. Word spread quickly and eventually we found someone who could do it. Maybe. He hadn't actually done it yet. And he was far away. And local was starting to get busy again. The clock was ticking. I had no idea how Titans worked back then. 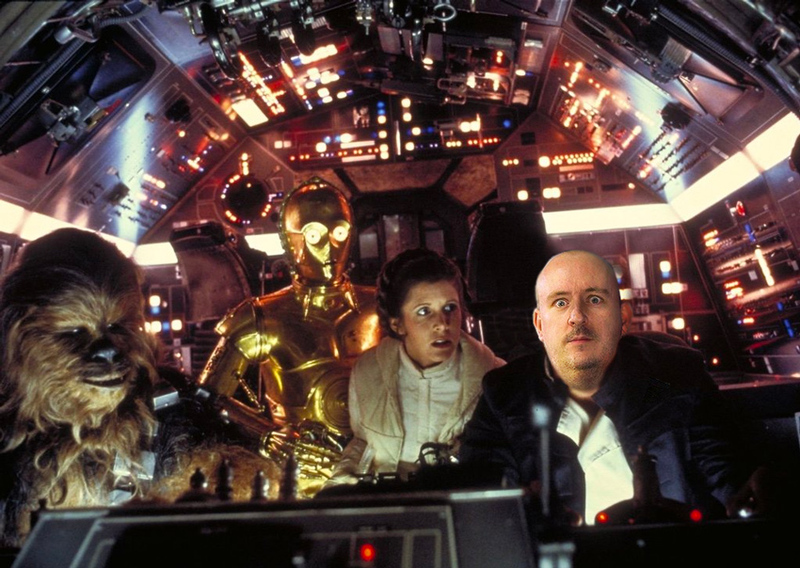 I figured he'd just jump in and we'd fly it home. But while the owners should have picked a better password, they did leave us with one major problem. Fuel. We didn't have any. With time running out on us we decided on the next best thing. We jumped the Titan a few jumps away into the middle of nowhere. And left it there. I imagine somewhere in the world is a former Titan pilot who logged back into Eve one day and discovered his Erebus wasn't where he left it. I never heard another word, so I can only assume he managed to get it back safely. Or was too embarrassed to mention it to anyone. I freely admit that parts of this story are hazy now. This happened almost a decade ago, so forgive me my memory of the details. But this is essentially what happened. For a brief moment in time I had stolen an Erebus. Much, much more than I could handle. I guess I've been a Pirate for longer than I give myself credit for. Back in 2012 I started advocating for the establishment of an official Memorial in New Eden to honor our fallen Capsuleers. The idea sprang from the loss of Vile Rat and several other friends in the Eve Community, fellow players that could no longer log-in to the game. Unlike in the case of Sean Smith (Vile Rat) most of those that never return are unheralded, unknown, or only discovered later by word of mouth. Or rumor. Or just never heard from again. The longer you play Eve the more this happens. It is, after all, only natural. Unlike our in-game characters, none of us reading this are going to live forever. 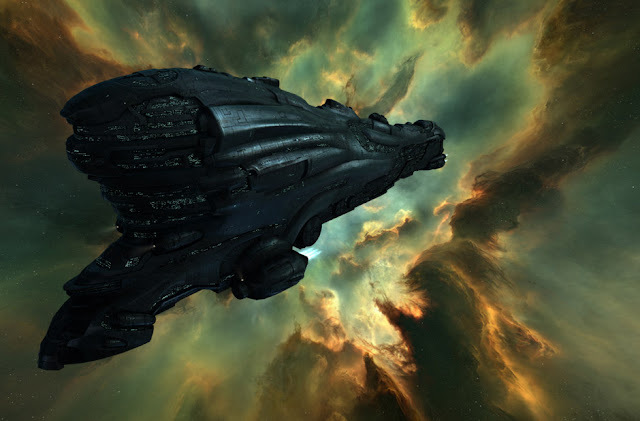 And for a game that intends to go on forever, Eve Online may very well outlive all of us reading this article. Including your friendly neighborhood Pirate Lord. And it occurred to me back then how strange this must be for our characters inside of New Eden. I'm certainly not the only one that has suffered loss in Eve. Player created memorial sites have popped up all over the cluster, at the Eve Gate, in Molea, and in a few other places. Often just random cans scattered around Gates with special words written in memory of a lost friend. My concept is not intended to take away from those gestures, or to lessen them. My concept is only intended to formalize that idea into a singular and official Capsuleer built in-game Memorial. Something built to honor ALL those lost and never to return, not only those that happen to be famous, or with friends willing to drop a can in their memory. If Eve is a friendship engine, as Hilmar has wisely stated, then part of that process has to deal with the loss of those friends. I personally know of at least a dozen people that have passed away during my time playing the game, and I hate to think of those that I don't know about. Lost connections. Players who disappear never to return. It starts to add up after a decade of playing. This is an idea that works from every angle. From a lore perspective, from an in-game perspective, and from a real world perspective. There is no viable argument to be made against it. 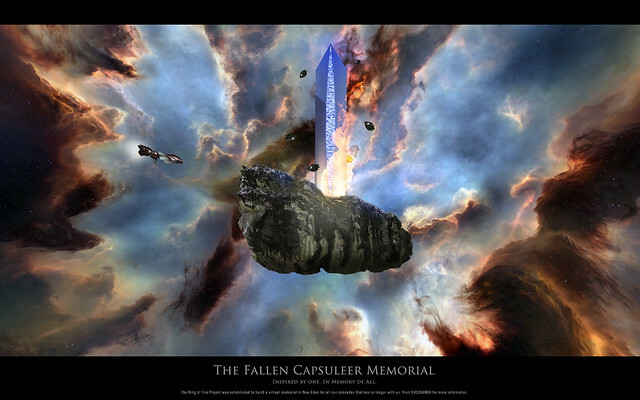 In my opinion, eternal Capsuleers would have already constructed something official in space to honor those that have passed away. In fact, death and loss must be even more terrible for beings that consider themselves eternal. So let's get this thing done. I volunteer whatever services I can offer to help make it happen. By this time you are all familiar with the breaking news this week that Brisc Rubal and several other Alliance members in The Initiative got into a bit of hot-water with CCP. The former managed to incur the worst possible punishment an Eve player can get and the other two got one-year bans. Which is horrible enough to imagine. I'm not here today to replay this story. Mostly because there is absolutely nothing to comment on. Either he did it or he didn't and none of us know anything about it. Only Brisc and CCP know. And I doubt we'll ever get the truth. For me however, there is more to this story than the act itself. When I started playing Eve the distance between my real life and the game was gigantic. I never told anyone in-game where I lived or what I did for a living. I stayed off Social Media and rarely even commented on Blogs. The fact that my Son played with me at the time was also a huge secret. We never told anyone. Primarily the reasons were obvious. My Son was a minor at the time. I owned a successful but struggling business. And Eve was the first (and only) MMO that I had ever played. I had no idea what I was in store for. The journey from there to today is a decade long act of trust. Even once I started writing this blog my real life tended to stay in the background. Originally my Twitter handle was only intended for in-game commenting. Gradually, and sometimes not on purpose, my real life and my gaming life started to merge. In that decade I've been doxxed several times on Reddit, I've had stalkers, personal threats, my account was stolen three times (once for over a week), a legit criminal once threatened to beat me up, and my personal choices have been made the subject of much debate on a wide variety of platforms. My Wife and I have traveled to Iceland three times, to Amsterdam, to Vegas, and we've had three player meets at our home. With another one coming up in July. (You should come, it is a blast!) 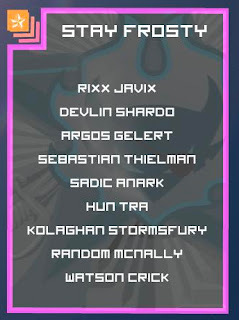 At this point there is no distance between Rixx Javix and Bryan Ward. We are both the same person. For all intents and purposes. This week's events have caused some level of concern regarding that distance. Is this really the smart way to go? But the cat is out of the bag now, you can't put it back. Insert your own favorite analogy here, the point being - is this ok? First of all, I'd never be in the same situation. 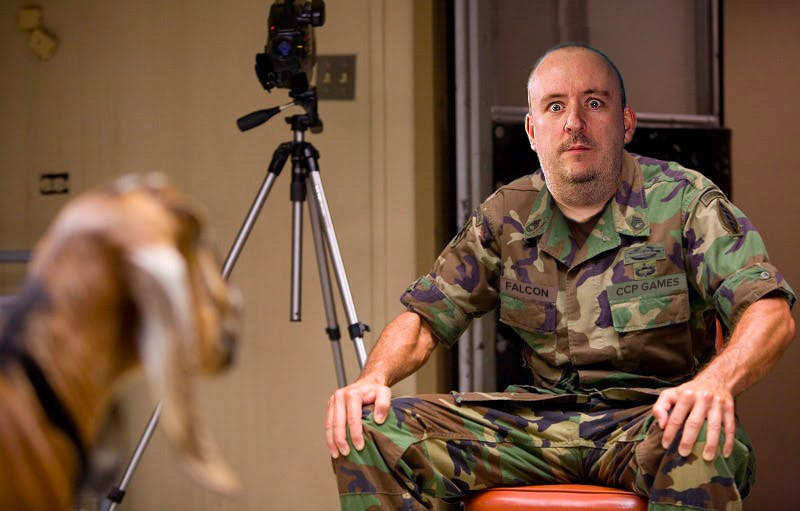 For one thing I'm not running for CSM. For another, I've signed hundreds of NDA documents over the years and I've never broken a single one. I know things about obscure manufacturing products that I will take with me to the grave. (Mostly because I've forgotten them.) All of that is true, but that doesn't mean some other situation couldn't happen that would expose the connection. The great thing about that connection is that it is entirely built on trust. Trust that is hard earned. But trust, like so many things in life, is a two way street. My involvement with Eve and the community is not a secret. From anyone. 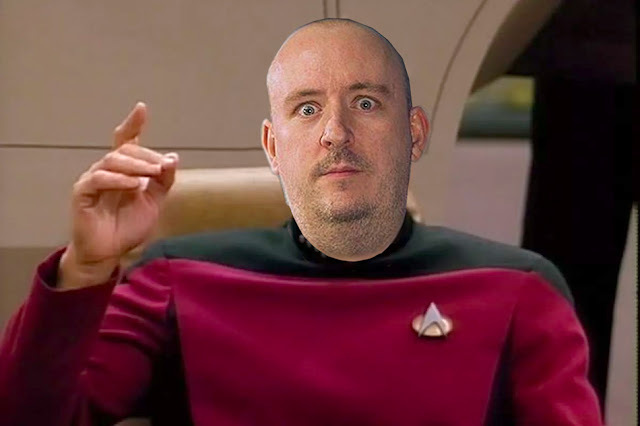 I just spent an evening with the President of our company yesterday explaining the inner workings of Eve Online and the community. I talk about my involvement, travels, adventures, and how great this community is to anyone that will listen. Or anyone that wants to know more. The rest isn't a secret. I'm an open book. Years ago a few Eve players contacted my Ex-Wife to inform her of my dealings in Eve Online. This is a fact. And I'll never forget the day she showed up with literally this entire blog printed out, along with whatever else she could find on the Internet. She was so proud and thought she had caught me in a lie. She forgot that just because you personally don't know something, doesn't make it a lie. (I started playing Eve only after we had separated.) 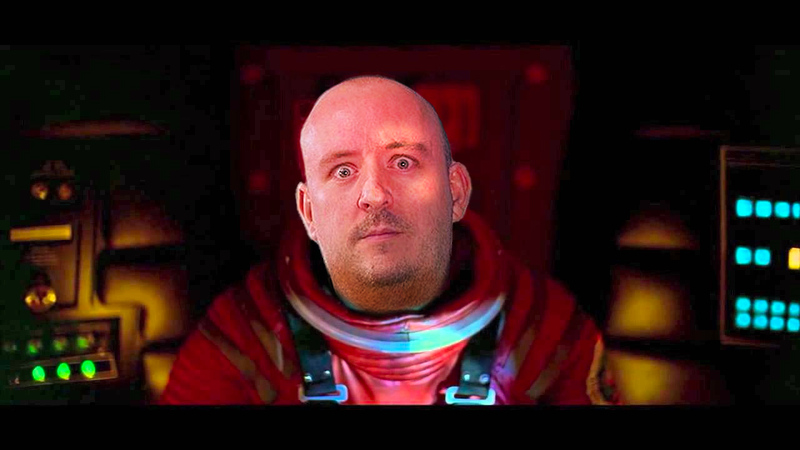 My dealings with CCP were in my disclosure documents already. And the fact that I play an online video game? The Judge laughed and we all moved on. In Brisc Rubal's real life, if anyone mentions the NDA, all he has to do is say, "Oh, you mean that video game I used to play?" That should pretty much put it in the proper perspective for normal humans. The tunnel vision that Eve produces is legendary. In both PvP and in other aspects, like this situation. But it isn't real life. Rixx is a bunch of pixels at the end of the day. The only thing real about him is the player behind him. And that's me. I always say that eventually the truth will out. And I believe it. Whatever the truth of this situation with the CSM, CCP and with Brisc might be - the consequences are already determined. We may never learn the truth. There have been other CSM situations in the past that we still don't know the truth about. And this may just be yet another one of those. As for me? I'm just going to keep on doing what I always do. Keep plugging along and keep being myself. That's all any of us can do. Nothing else will endure. Download the Wallpaper in various sizes! 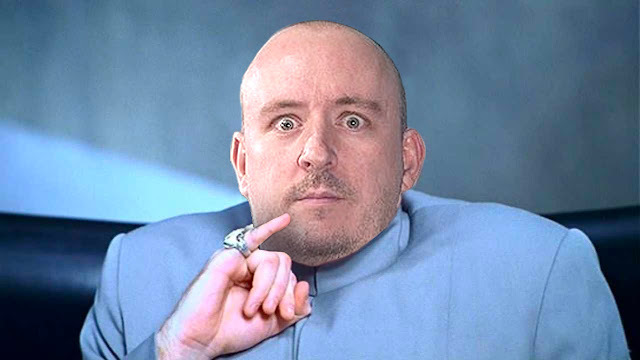 Middle of last week I see a Tweet from Jin'Taan saying the upcoming Streamfleet Invitational Tournament is two teams short. I hop on our Discord and start asking if anyone would be interested in us putting a team together and the whirlwind starts. 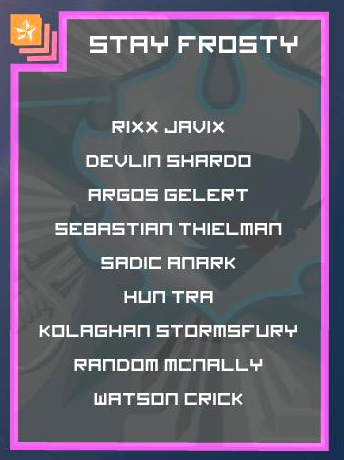 We're several weeks late and it will take a herculean effort to not only put a team together, but to organize 10 completely different compositions according to the Tournament rules. So we did it anyway. Crazy Pirates. Not only did we manage to hobble together enough pilots but we've also managed to make huge strides in not only putting together some compositions, but good ones. Not perfect obviously, but given how short our time has been - they ain't bad. And they will only get better. We managed to have two complete practice sessions this weekend and those went extremely well. We managed to hold our own. We even got hot-dropped on Saturday. Who hot-drops on the test server? I like the way this Tournament is set up, it should make for a very interesting set of matches. We need five compositions for each day and we can't use the same ships twice, in addition each slot in the comp is pre-defined. So T1 Cruisers in slot one, Assault Frigates in slot five and so on. Those are just examples, I don't have the rules in front of me as I write this. But you get the idea. And, most significantly, no Logistics. It's funny how much of our Alliance Tournament planning centers around Logistics. From planning comps, to bans, to actual tactical operations during matches - so much of what you do in the AT is determined by Logistics. It's only natural, but not having to worry about that creates an interesting dynamic that I think will result in some extremely interesting matches. Pure PvP. Face punching glorious PvP. So mark your calendars and be there on April 20 & 27th at 20:00 UTC. And root for Stay Frosty! I was trying to find something on the Interwebs this morning and happened across this (almost) six year old Community Spotlight: Eveoganda that CCP ran about me back in 2013. Roughly the half-way point of my Eve career as of this writing. The funny part is that article ran well before what I consider to be the most active portion of that career. Two years before the 8 poster deal with CCP, and our three trips to Iceland, before Vegas, before WWB, before the AT Tournament runs, before so many things. But mostly before the huge creative output that started with the Art Prints that led to the poster deal with CCP and everything that came after that. Which just highlights yet again just how quickly five or six years can get behind you. I've been at this game now for over a decade. I've quite literally produced several thousand pieces of art and logos and paintings and drawings and memes and goodness knows what else. Not to mention millions of words here on these pages. You can't move around the Eve universe without bumping into my work. And while that is awesome, it does beg the question - why? It is an easier question to answer now in hindsight. It is often challenging to see yourself clearly in the moments of your active life. But often, it is far easier to look back and see things more clearly. Perspective is a huge part of that. In the moment we have no idea of how things will work out, what the consequences will be, how our decisions affect not only our lives, but those of others. For me Eve started very simply. My Son enjoyed it and I played pretty much just to have something to share with him. Divorce is hard. My Divorce was nightmarish and legendary. And we both needed a distraction that we could share together. Eve filled that in both of our lives for a number of years. In those early days I had a business to run and my time was limited, but we had Eve. And I essentially just followed him around and tried to keep things interesting. As his interest naturally wained as he got older, my own life transformed drastically. 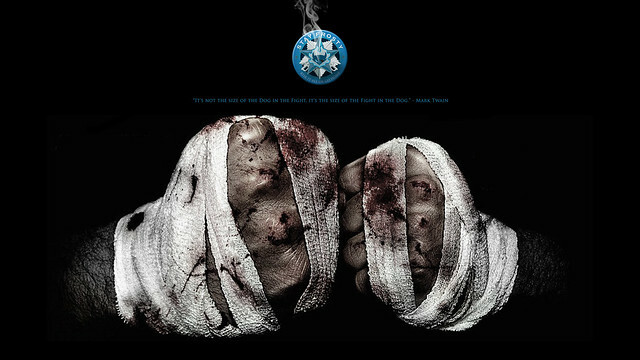 I lost the business and found myself knee-deep in the fight of my life. A fight which took years to finally lose and at great cost. During that time Eve became much more than just a game. It became an outlet. And not always a good one. I'm the first to admit that mistakes were made. I wasn't always thinking clearly in those days. I could tell you about the huge amounts of stress I was under. The fear. The pressure. The frustrations. Not as an excuse, only in hindsight. But ultimately what happened was far more powerful. We went to Iceland in 2015 and we (my wife and I) met our very first Eve players. And our first CCP employees. And while much of the mistakes that would haunt me for the next two years were handed to us by certain of those CCP employees (none of whom are still with the company), they would all eventually get cleared up. Or swept under the rug. Or replaced. The real point here is that meeting people was the beginning of a much better time. And launched the second half of this journey. A much better and more active half. I don't think it is coincidence that my real life has also improved significantly during that second half. In fact, I can attribute it (and I do attribute it) to being a significant part of the reasons why. My real life is under a constant state of transformation, my professional life has always been transforming, and I think it is only logical that my Eve life does the same. As most of us do. The only constant is change, after all. I've done all the things I've done because I had to. I have to keep busy. I have to keep being creative and challenging myself. Eve just became a very natural place to express those desires. And slowly, over those years, the community and the real friends we started making - only made that desire turn into a passion. Today I can't even imagine life without Eve in it. Without the community, our friends, our associates, CCP, Iceland, our Tour Guide friend in Iceland and his dog, our world-wide network of people that we care about and who care about us. It might be weird to some people, but to us it just feels natural now. And normal. It's the kind of place where hearing about a CCP employee leaving the company results in us jumping on a plane and flying to Europe. With an illustration I spent two days creating. Just to be able to say goodbye in person. So that's why. In a couple of months we are flying to Seattle to get on a ship with a bunch of Eve nerds for a cruise to Alaska. And when I think about that trip, I don't think there is anything unusual about it. I can't wait to see what the next five years brings. 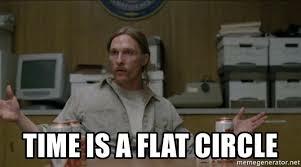 Time might be a flat circle, as Rust Cohle mentioned in True Detective season one, but so is Eve. In fact, Eve is even more of a flat circle than life ever could be. All you need to do in order to experience this for yourself is hang around long enough to see it in action. And maybe attend a few player meets here and there. Nothing brings out the weirdness of Eve time like meeting people that play the game over a few years. Back in the early days of this blog, when I was writing almost every day, I would constantly have to preamble my posts with introductions and recaps. A few longer term readers would get annoyed by it and a few select haters would use that tendency against me. As if introducing new readers was a weakness or something. 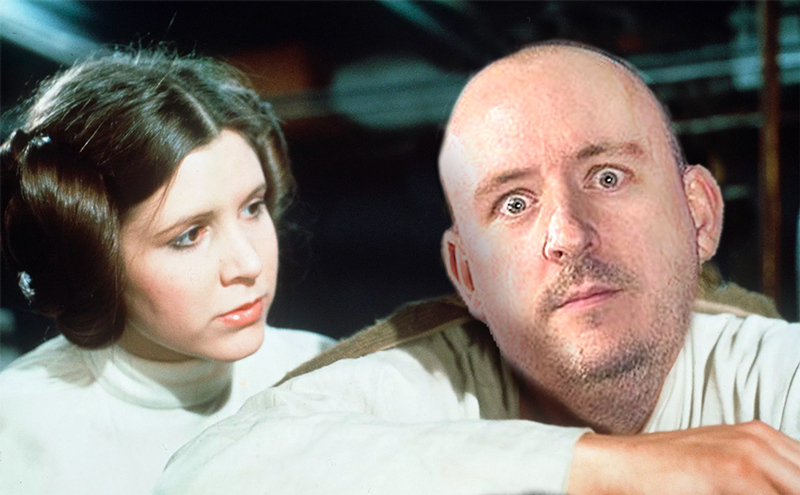 Thing is, as Hilmar recently pointed out, Eve brings in new players every day. I believe he mentioned 10,000 a month as a number. Granted, most of them don't stay around long (sadly), but that is a lot of new players. This hits me every so often. It hit me again in Amsterdam. Lots of new players I've never met in person before. The typical hello, who are you? 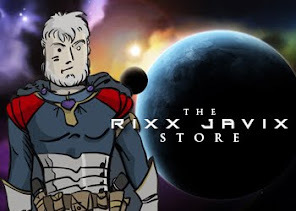 I'm Rixx Javix. And then a blank stare. Hmmm. (I hope we are all on the same page, this is intended as tongue firmly in cheek.) But despite being funny and also humbling (which I don't need more of thank you.) it is also indicative of the flat circle nature of Eve. And also of how little Null Sec players pay any attention to anything that isn't Null Sec related. I was even mistaken for a Streamer by several people, who I gladly let continue thinking that. Far be it for me to correct them. They seemed 100% sure I was a Streamer. And that they used to kill me "alot" back in the day. I find all of this endlessly fascinating. It is after all only a microcosm of real life. No matter what you've done or accomplished or written or acted or otherwise lived thru - when you meet someone new they have no idea. Unless you are famous. And then you might be surprised by what they know you for. It might even be totally wrong. This is why resumes and CVs exist. Or the entire point of LinkedIn. A small summary of your work life and history. So people can make snap judgements about you in peace without any messy feedback from you. lolz. And so it goes. And no, not everyone I met in Amsterdam didn't know who I was. But some didn't. And some thought they did, but they didn't. Like I've said before, it is all endlessly fascinating to me. I enjoy it all. And it is part of the process of meeting new people. Establishing ourselves. Sharing what we want to share and holding back whatever we want to save for later. Little synopsis bit of ourselves. As time goes on it becomes clearer to me how much Eve itself is constantly being churned and rotated around. Eventually it all becomes an endless circle of birth and death and rehashed movements. Both on a personal micro and larger macro level. Just some musings for a Monday. I was sitting next to my Wife when the news came over Twitter. CCP Guard would be leaving CCP and Eve Amsterdam would be his final "official" player event. Two things immediately popped into my head, 1) We needed to go to Amsterdam, and 2) I needed to do something special for the event. I ran to my studio and started hitting up Discord. I wasn't the only one with an idea that something needed to happen and suddenly, as is often the case, things started happening within our community. While I was waiting to hear back I started playing around on the computer. And the idea for this illustration sprang fully formed into my head. Having just been to Eve Vegas and watching Guard up on stage (for the fourth time) really drove the concept of this Rock God idea. 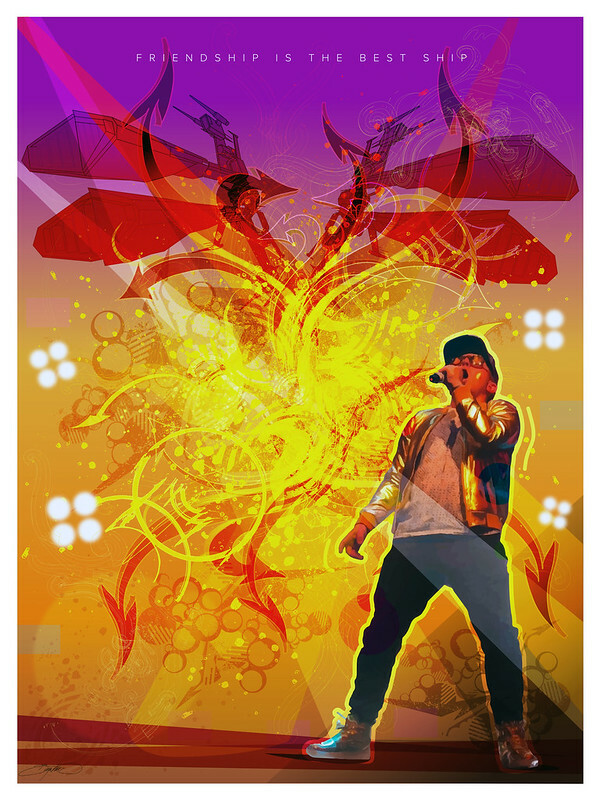 I wanted to create a rock poster that featured him doing what he does, but conceptually I also wanted it to be about more than just singing. To me the genesis of the concept is this light show cloud from which springs forth all manner of things. To me it symbolizes what he has done for the Eve community all these years. His power fuels us all. And, you know what, I think I managed to capture all of that. We were up against a hard deadline. The poster took me two full nights to complete, during which plans started to form. 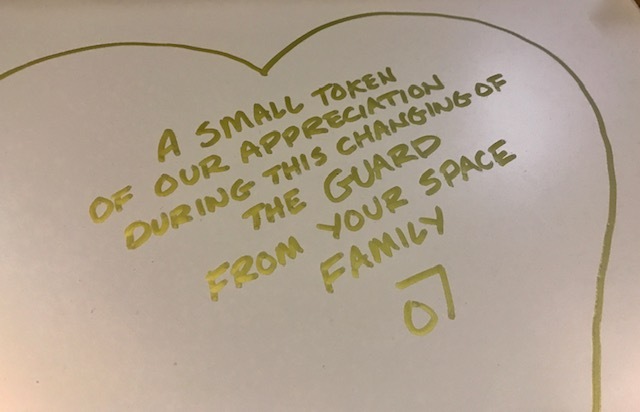 Jake Miester started raising some funds to come up with something to give Guard as a gift. Bam Stoker and Ms Moses were busy with a compilation video from players ( I recorded something, but I guess I didn't make the cut ) and others as well. So Jake and I schemed a way to make this happen under a very tight deadline. I sent him the digital files and he got it printed over in Europe. The final poster was finished and delivered with very little time to spare. Jake did an amazing job of organizing things and making sure that everyone got to sign the back of the final piece. Even though I ended up signing for about 10 people who couldn't make the event myself. And then I wrote something short for the back with Jake's help. My Comic Book Lettering skills, while rusty, certainly helped. We were told not to speak while on stage presenting our gifts. Of course I never listen. I only managed to say one sentence and it was, "This is from everyone." 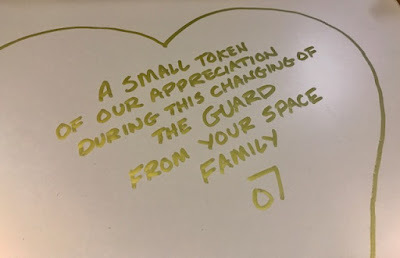 Later I explained it more fully when I told Guard that the illustration was from everyone in the Eve Community. Not just Jake and myself. That's how I feel about it. I didn't think of this, create it, and travel all the way to Amsterdam for myself. I did it for all of us, because I could. I also created 400 Guard buttons so that everyone at Evesterdam could have a memento of Guard to take home with them. Which I thought was pretty cool. So that's the story of that moment in Eve History. And not to slight Jorg, FieryRed, or Sebastian who also had gifts to give him. Those are their stories to tell. o7 Sveinn Kjarval and best of luck to you in your new job. No one there knows how lucky they are to have you yet. But they will soon enough. Luckily my Wife is a Wiz when it comes to making these trips work for us. I don't know how she does it, but she always finds the best deals and amazing rates for these trips. And all the pieces came together quickly for this one. So later this week we'll be landing in Amsterdam for the first time to attend the event. This will also be our first time in continental Europe, having been to Iceland three times doesn't count. So that is pretty exciting. I wanted to be there to see Guard off and to do something special for him. Like making the trip across the ocean. That's a big part of this obviously. But we've talked about this trip for years, so the Guard thing was more of an excuse than anything else. Don't misunderstand, it's important. But it was more of a catalyst than it was a prime driver. Going to Eve events is a HUGE reason why I'm still playing Eve. Since Fanfest 2015 we've been to two more Fanfests, Eve Vegas, and a few smaller events. And we've hosted our own Steel City Eve event three times, the fourth one is coming up this Summer. And this year we'll be going to Evesterdam, Eve Toronto, the Cruisers of Eve, and maybe something else later in the year. But meeting other players, making friends, re-connecting, and spending time together is a huge reason why we do these things. It's fun. And it brings Eve alive in ways that are unexpected and long-lasting. I highly encourage you to attend a player event near you. Even if you can't go to one of the big ones, check Eve Meet and try to hook up with some local players. Those are great too. And it makes a big difference. The decision to go to Evesterdam happened quickly so we didn't have a lot of time to prepare. But I did manage to get some new swag made, which we will be bringing with us. And also all the remaining swag in the famous swag bag. Plus I have some surprises planned, but those are all OpSec for now. We're both really looking forward to seeing old friends again and, as always, making new ones. Like I always say, don't be afraid to come up and talk. That's why we are there. And if I miss you, be sure to ask for some swag. That's why I make it. I really do want to meet you. I'll have pictures and stories to share. And I hope to see you there. 8,339 fights, and those are just the ones that ended in an explosion, later and what does a Killboard truly mean? The above is an image of my zKill page today after ten plus years of playing Eve Online and about seven years after I stopped playing in Null and moved to Low Sec and started losing my sec status. It is neither the best Killboard nor the worst. And this week is the first time I've seriously looked at it in over a year. Look, you may or may not believe me when I say this, but my Killboard doesn't mean much to me at all. I rarely look at it. And when I do it is for two reasons - 1) To make sure an engagement has been recorded, and - 2) To see what my Efficiency percentage is. I like to keep my efficiency around 75%. The reasons for this are derived from wisdom I was given years ago by other Pirates I respected. A high efficiency percentage denotes a risk-adverse approach towards engagements. Pilots who take easier fights they believe they can win. And a lower efficiency percentage denotes pilots that are struggling with PvP. When I look at an enemies killboard (which I rarely do) efficiency is the first thing I look at. It would be easy to find an example of a poor killboard, so instead let's look at one from a pilot who I know thinks they are elite. I've removed the name obviously. The first thing you notice is the 90% efficiency rate. And indeed one of the first things you'll notice about this pilot's KB is the amount of 100+ pilot kills. With a 13% solo rate, most of which are easy kills, this pilot is essentially hiding in plain site. This tells me that this pilot probably has help waiting nearby. They also don't honor 1v1s, but that is a story for another time. I don't bring this up to shame that pilot, which is why I'm not mentioning their name. But only to illuminate a common trap that some players fall into. Because this looks like a solid killboard at first glance and many people would judge this pilot as a "good" pilot. But a closer look tells you exactly what kind of pilot they are - the kind that will explode your T1 Frigate with an Assault Frigate using a wingman. Efficiency alone is not enough to determine what kind of pilot you are however. While an efficiency above 90% is telling, combined with the solo rate and the gap between wins/losses, and that insane 99% isk gap - those factors combined tell a more complete story. You can see higher efficiency rates in pilots that have simply gotten much, much better at PvP over the years. Or have focused on different aspects of the game, such as Null fleet fights, etc. So a high efficiency percentage is not always a bad thing. So what does my Killboard say about me? First of all I obviously take a lot of high-risk fights and I lose about 25% of them. I'd certainly like that rate to be better, but I'm not going to stop taking pretty much every fight I can. That's the only way those incredibly awesome wins happen. I'd like my Solo rate to be higher, but I am also the CEO of Stay Frosty and that means I end up sharing a lot of fights with my Corpmates. That isn't going to change either. Although I have been trying to focus a bit more on my solo work lately. I know pilots with 12k kills or more. And I know pilots with tons of losses. I've seen pilots streak and gets lots of kills and then burn out and quit. And I've seen pretty much everything in-between. Years ago I decided I was going to play Eve forever. And since then I've rarely spent time worrying about my killboard. I'm in this for the long haul and for the fun of it. My focus isn't on numbers, or percentages, or anything else other than trying to gain the maximum amount of enjoyment I can from my playtime. That is how I choose to play Eve. That style isn't going to be for everyone. And I highly recommend you play Eve however you want. But remember this, over ten years of playing an aggressive, yarrr-based, maximum fun style in this game and my efficiency stays right at 77%. Like a rock. I often tell people who ask, "Be the content you want." It is a piece of advice that I wish someone had given me back when I first started playing Eve Online over ten years ago. But then, if they had, I may not have understood it. It took a lot of wars, moving, trying things, learning, failing, and generally trying to find my own way - before it all started making sense. So what does that even mean? Be the content you want? People tend to whine and complain that certain parts of Eve are terrible, or dead, or not as active as they'd like them to be. For some Eve players, that attitude is normal. Low Sec is dead they'll say. Solo is dead they'll say. Just look at Reddit any day of the year and you'll find one or two or more posts about some section of Eve that ain't working right. Thing is though, Eve Online is a sandbox. It is literally a blank slate. If I log in and think, you know what we need is a good old angry brawl. I go make enemies with someone and get them to hate us. If I log in and think, I should go find some good solo fights, I go fly around solo and find some. We've taken Sov on a whim, because it sounded fun. We've invaded, we've prodded, we've taken down Citadels, pretty much anything you can imagine and we make it happen. We generate our own content. We are the content. Too many people seem to believe that Eve is a passive experience that happens to you. It isn't. Sure, you can undock and wait. Eventually something will happen to you. But that isn't content, or all that interesting, or sustainable. Eve isn't a passive experience. It isn't a roadmap, or a platform, or a goal-oriented console game. Eve is an active participation experience largely driven solely by your own will. Do you want to fight in a large fleet battle in Null space? Then go make one happen. I've done it many times. I've created wars. Or helped to create wars. Or prodded people into making them. Because at one time that was what I wanted. Not always alone, don't get the wrong idea here. 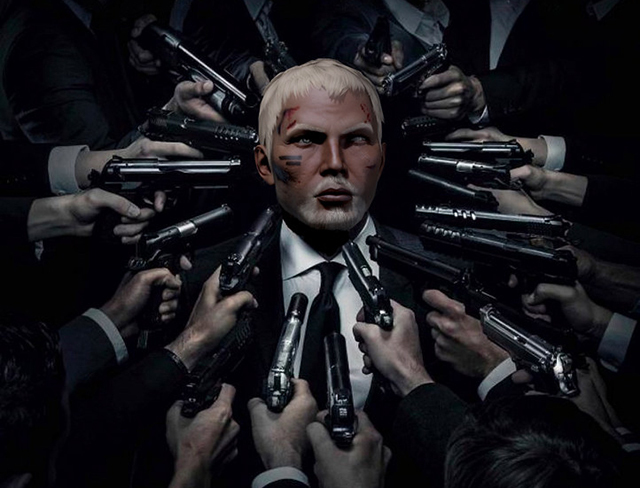 Sometimes it takes getting a bunch of people on your side, or influencing a group of people, or going into enemy territory and causing trouble, or talking on Discord, or spending a lot of iskies, or whatever. But one person can do it. Put your mind to it and suddenly there is World War Bee. Or another invasion into Providence. Or another war in the North. But Rixx, you'll say, I'm only one person. Good. Because everything that has ever happened in Eve's long, storied history was started by one person. Not the same one person. But hundreds and hundreds of them. That's how this works. And it just doesn't work for PvP or Wars or conflicts either. It works for everything. Whatever you want to happen in Eve, go make it happen. Seriously. Is it always easy? Will it always work? Nope. It can be hard and often it will fail. But you'll learn. And you'll know better the next time. Or you'll discover something even better. Want a media empire? Go make one. I can remember back when Nashh and the guys at +10 started Eve_NT with little more than an idea and a player event in Nottingham of all places. A few years later and they are hosting the Alliance Tournament production. I could name a hundred other examples. I remember when Katie Sae started the journey to visit every system in Eve. And here we are a decade later - every system visited with no ship losses. Amazing. But it doesn't have to be big content. It can be extremely personal. Just undock and make it happen. Start a conversation. Plan an event. Plant your flag in a system. Haul cargo. Buy low and sell high. Explore. Try something new. Join a Discord server. Whatever it takes, it only takes one step. And who knows where the journey will end? Once long ago I had never heard of Eve Online. My first day I tried flying to the gate directly because I didn't know about right-clicking or warping. And every adventure, every war, every conflict, angry poster, horrible comment, and everything else that has happened in the last ten years plus came after that day. Be the content you want. And others will follow. I couldn't resist. And since I don't go on Reddit, I'll post these here. And over on Twitter. So yesterday I passed 200 million skillpoints on Rixx. The skill that did it was Capital Blaster Specialization IV. Ten years and six months later and the last great milestone has been achieved. I say that like it means something, and while passing 200m skillpoints is a big deal and a long-time goal, it is just another arbitrary milestone. It only means something if you want it to mean something. Almost all of that training has been done the old-fashioned way. A few times before an Alliance Tournament I have injected or topped-off a skill or two, but mostly I never needed to do that. I only have one level V sub-cap spaceship skill to train and that is Precursor Battlecruiser V, I paused that train in order to train up the Dreadnaught skills. I have all other PvP Sub Cap skills fully trained. And almost all of the support skills, except for a few weird ones out on the edges. So after I finish these last few Dread skills, what next? It is entirely possible that skill training for Rixx might come to an end here in the next year. Right now my skill train is sitting at about 345 days and is full of very obscure skills and remaining level V top offs. Stuff that I don't exactly need, but things that could prove useful in certain situations. But not much of a critical nature. Except for Medium Beam Laser Spec V maybe? lolz. But the truth is that I will more than likely just keep training Rixx until the heat death of the universe. Every time I look at the skills I see things that would be nice to have. So we'll see. I remember my first 1 million skill points. I remember what a big deal my first 10 million, 20 million, 50 million - what they all meant and how important they all felt. But I also remember the advice I got from an older player back in the early days, "There is always more ahead than behind." For the first time since I started playing back in 2008 it feels like that isn't true anymore. And maybe, after everything else, that is the meaning that this milestone has that the others didn't. There is less ahead now. Gosh, that felt kinda sad to write. This was supposed to be a happy post!! 200 MILLION SKILLPOINTS! Wooohoooo! PS: Some of you may have noticed I am currently -9.9 and not my usual -10. This is because I got bored and started shooting those NPC mining fleets for fun. The fun part isn't shooting them, but dealing with the support fleets that come to their aid. I have to admit, those are pretty fun for NPCs. If not now, when? That's the question I kept asking myself this week. I've been ruminating and rolling the idea around in my head for a long time now. I should get serious about putting a book together about my adventures in Eve Online over the past decade plus. I really should. But something always kept me from getting serious about it. Perhaps the daunting nature of such a project. Perhaps the wall of CCP legal. Perhaps just the natural lazy nature of my core being, something I fight against daily. Or perhaps that voice in your head (or at least my own head) that keeps telling you that you'll get around to it someday. Finally I had enough. This week I told that voice to shut up and be silent. And, as always, the only way to make it be quiet is to commit to doing it. So I've made the commitment to myself to stop thinking about it, delaying it, or putting it off until tomorrow. I'm going to move forward with this project, one way or another. For those of you that do not know, I've previously created two ebook projects based on Eve Online. 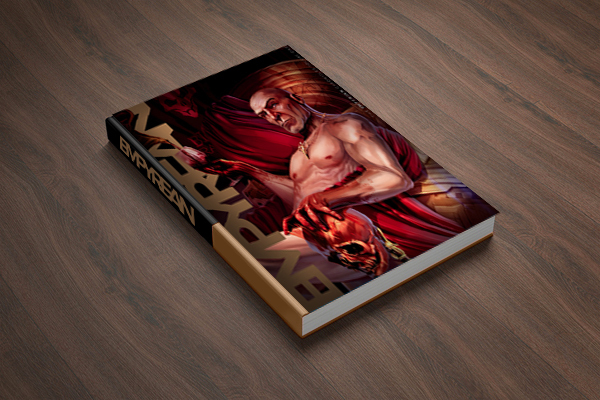 The first was an Art of Eveoganda Book that I published a few years ago, before the poster run that eventually led to the line of illustration posters that CCP published in 2015. You can still download that book at this link. It has been downloaded over 10,000 times from that link alone. The other ebook is called Empyrean Chronicles Vol 1 and it is pictured in the header image above. It is also still available for download at this link. It has been downloaded over 15,000 times from that link and more from others - although I don't have access to that data. So I've managed to produce two books already. Although obviously those were always intended as ebooks and nothing more. But they do prove I can do what I say I'm going to do. Which honestly shouldn't be a question at this point. So what would this new book be? I'm imagining a fusion of art and story that follows two tracks, one from an in-game perspective and one from an out-of-game perspective. 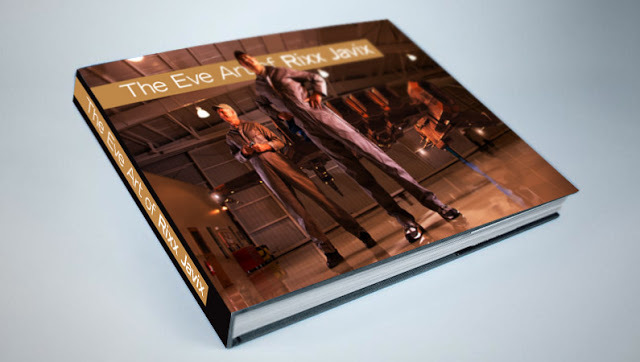 Essentially the story of Rixx and his adventures inside of Eve and his eventual rise as the Pirate Lord of Low Security space and the most infamous Pirate in all of New Eden. And also the story of me as a player and my adventures in the community at large, hats, frills, illustrations, fan art, this blog, wars, and meta trials and tribulations. There is a lot there. Goodness knows I've been involved with just about everything that has happened in the last decade to one degree or another. And I've certainly had more than my fair share of haters, fans, and more. That sounds like a very compelling and interesting story. And a unique one that I don't believe has ever been told before. And that, to me, is the part I am most excited about. I don't believe anyone has ever told a story like this before, especially one from so many different angles in regards to a MMO, with Fan Art, gaming community, and player perspectives all mashed up into one story. So what does this mean? I have no idea. Writing this blog post and committing to doing this is my first step. Now I've locked myself into it. So I have no choice now but to move forward. How I do that, what that means, how it works? No idea. So next step is to discover what the next steps will be. In the meantime, how does this sound to my readers? Are you excited about this project? Is this something you think sounds like a good idea? What are your thoughts? As always, I'm anxious to hear what you think.